Even in summer, Madison has so much classical music taking place that occasional train wrecks occur. Take this Saturday night, July 16, for example, when two wonderful events compete for your attendance..
At 7:30 p.m. in Mills Hall (a free pre-concert lecture on “Pueblan Polyphony” is at 6:30 p.m.) on the UW-Madison campus, with the Madison Early Music Festival will wrap up its week-long exploration of early music in the New World with the All-Festival concert that features faculty and student performers as well as guest artists. But the bigger event by far will be the 10th annual FREE Opera in the Park held by the Madison Opera in Garner Park on the city’s far west side. 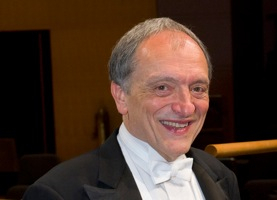 It will feature four guest singers and players from the Madison Symphony Orchestra, all under maestro John DeMain (below, in a photo by James Gill). The rain date is Sunday. The program includes music by Tchaikowsky, Rossini, Verdi, Puccini, Donizetti, Bizet, Leonard Bernstein, Richard Rodgers and Daron Hagen. 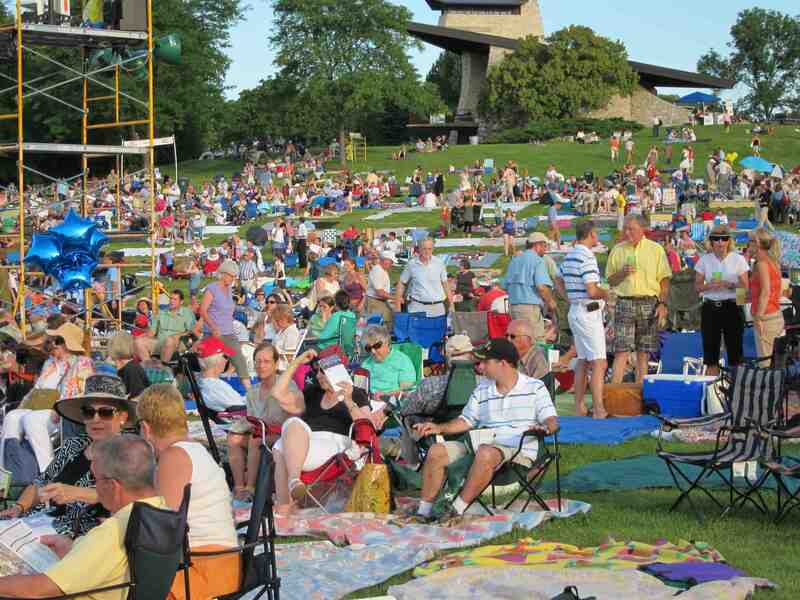 Last year, Opera in the Park drew a record of more than 14,000 listeners. 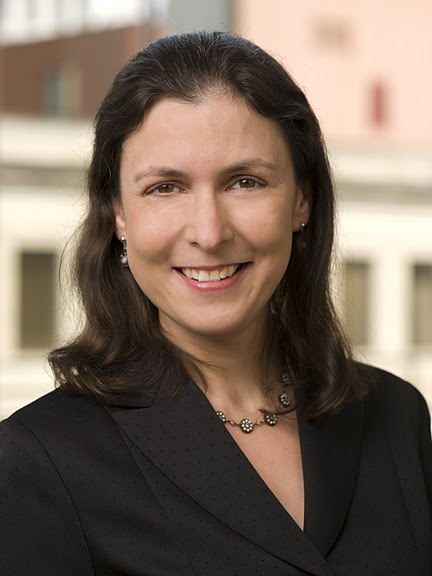 As a preview to the event, Smith (below, in a photo by James Gill) agreed to an e-mail interview with The Ear about he event and about herself. Consider her Q&A an overture to the biggest opera event on the year in Madison. What attracted you to the top post at the Madison Opera and why did you accept it? It was a chance to do what I love – put on opera – on a bigger scale than I’d be doing as general director of Tacoma Opera. Equally important, Madison is a community where I could see myself living; I was impressed by both the high intellectual level of everyone I met, and how supportive it was of its arts. What plans and especially changes do you have in mind for the future of the Madison Opera? I don’t have sweeping changes in mind; it will be more about evolution than revolution. There is some repertoire I would definitely like to try – and with John DeMain’s 20th anniversary with Madison Opera coming up in two years, we’re thinking about something special for that. I would like to add a young artist program to Madison’s mix, so we can expand our outreach in the community. So I’d say it’s more about building on the company’s current momentum to ensure we are engaging audiences and performing at the highest possible level. This is the 10th anniversary of Opera in the Park (below). Is there a unifying theme? Will there by new or different things this year? It is not only the 10th anniversary of Opera in the Park, but the final performance of our 50th anniversary season, so we’re looking back a little bit and into the future. Some highlights will be the choruses from Daren Hagen’s “Shining Brow,” which Madison Opera commissioned in 1993, as well as a duet from “La Bohème,” which was Madison’s first fully staged opera at Madison East High School. Also on the historical front, we’ll be closing the concert with excerpts from “Die Fledermaus,” which the Madison Opera Workshop first performed scenes of in its debut concert. As all four Opera in the Park soloists are going to be singing leads in either Tchaikovsky’s “Eugene Onegin” or Rossini’s “Cinderella” next season, we are doing arias and duets from those productions, so it’s a real preview of what is coming up. The theme, though, is the same as it has been in the past: great music, offered as a free gift to Madison. Although I was born in Hershey, Pennsylvania (my excuse for being a chocoholic), I grew up in Seattle and consider myself native to that state. I was one of only two kids in my Washington State history class who had a grandparent born there. I went to Harvard, then worked at Lyric Opera of Chicago for a season, then moved to New York to work at the Metropolitan Opera for six years. I returned to the Northwest in 2003 to run Tacoma Opera, 35 miles south of where I grew up. 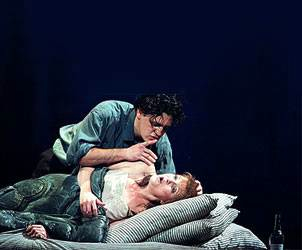 What are your Top 5 operas? Do you have favorite composers and singers? That’s always a tough question after the top one or two. I’d say Mozart’s “The Marriage of Figaro,” Offenbach’s “The Tales of Hoffmann,” Bizet’s “Carmen” and Douglas Moore’s “The Ballad of Baby Doe. The final place usually goes to whichever opera is currently obsessing my brain, generally after seeing an enthralling performance. As far as singers, I have a number of favorites, but I’m going to take the Fifth on naming anyone who is currently singing…. From previous generations, Kirsten Flagstad, Janet Baker and Alfredo Kraus. 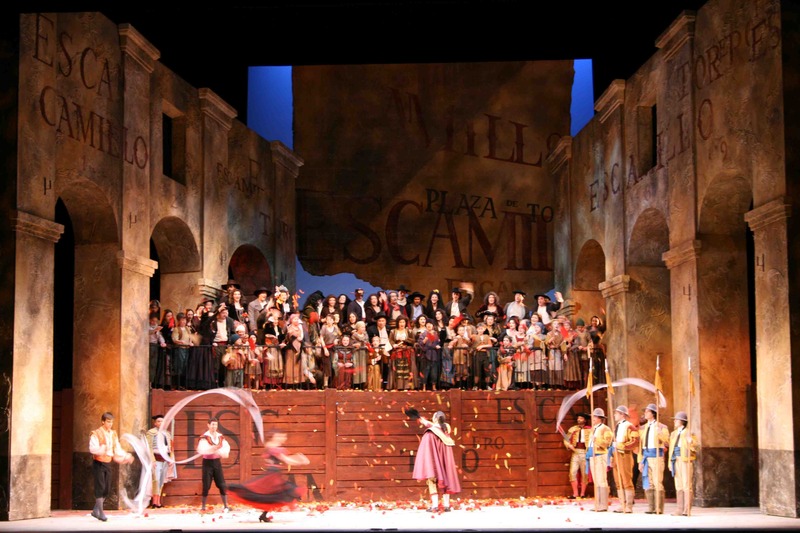 Are you a Puccini or Verdi fan? I’d say it’s on an opera-by-opera basis. I think Puccini’s “La Bohème” (below, in a later Madison Opera production) is a perfectly written opera, but I also love pieces like Verdi’s “Don Carlo” and “Un Ballo in Maschera,” which are a bit trickier to produce. Was there an Aha! moment – an opera or aria, a performance or singer – that hooked you and made you know you wanted to devote your life to opera? I sang in the children’s chorus of “Carmen” (below, in a recent Madison Opera production) at the Seattle Opera when I was in 9th grade. Although I’d been singing in a youth choir since second grade, and attending theater since age 3 (including a couple of operas), that was the lightning bolt that made me fall in love with opera. The kids in “Carmen” are in the beginning of Act I and the end of Act IV, so there was a lot of downtime to sit in the wings and watch what was going on. I became obsessed with opera in the way that teenagers do, reading books, listening to the Met broadcasts, and eventually working for Seattle Opera starting in 11th grade. For some reason it struck me as perfectly reasonable to want to run an opera company when I grew up. It still does. What are your impressions of Madison so far? That it’s got one of the highest quality-of-life factors of anyplace I’ve lived. Everyone walks/runs/bikes everywhere, everyone is a major foodie (and I mean that in a positive way), and everyone loves living here. I’ll see you on Saturday night at Garner Park!